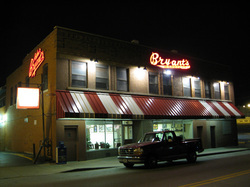 I love the idea of Arthur Bryant's. 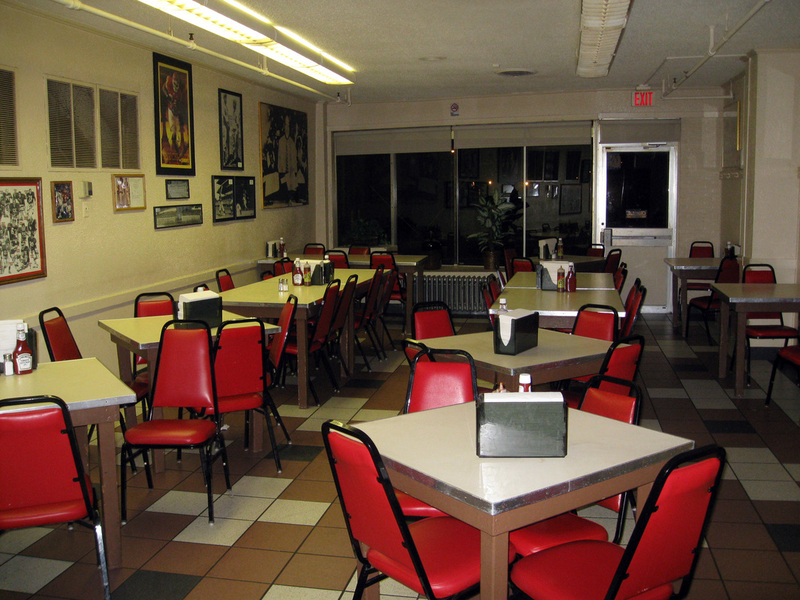 It's an institution, and I give it credit for staying the same, small, cool place it was 50 years ago. I admire it's many famous visitors and fans, and I respect it's history and heritage as one of KC's all-time bests. That said, I just can't get past the fact that the food has been bad the last few times I've been. 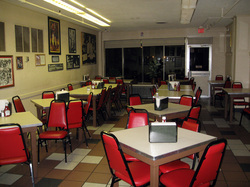 What's more, the portions have shrunk, and the service is not as friendly as it has been in the past. Whenever the Gates/Arthur Bryant's debate came up I was always the first to defend ABs, but now I'm just not so sure. I may or may not give it another try in the future but, after these past few disappointing experiences, I think they may have lost me as a fan. Try the pulled pork open-faced sandwich and a cold mug of Boulevard. 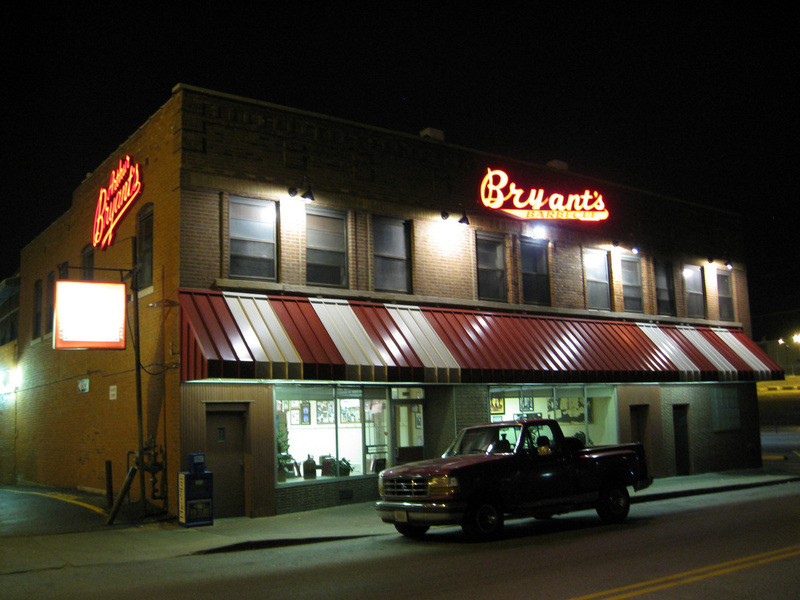 The one thing I love about Arthur Bryant's (the original location) is the fact that it hasn't seemed to change much in, say, 50 years, and I like it that way! 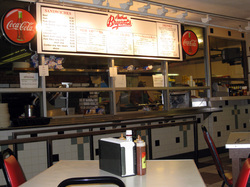 Red and white checkered floors, unassuming white formica tables flanked by simple red pleather diner chairs, white walls adorned with pictures of famous BBQ fans, and big red, black, and white menu board, and a cafeteria-style order counter where you yell your order in through the window and then watch it being prepared right in front of you. The tables are set with big bottles of ketchup, 3 kinds of AB sauce, and huge piles of napkins that promise delicious, saucy, sloppy meals that get all over the place. Mmmmm. The one thing I don't particularly appreciate is the big flat-screened TV playing basketball right in the middle of the main room. Call me crazy, but I swear that wasn't there the last time I came. I remember a smaller, old-fashioned TV in the second dining room, but now there are 2! And, I remember music, fun music that I used to like to sing to. Tell me, please, why does every restaurant these days insist on having a TV? It's my new pet peeve!! Go ahead and eat, people and, for God's sake, leave the TV at home! You can do it! 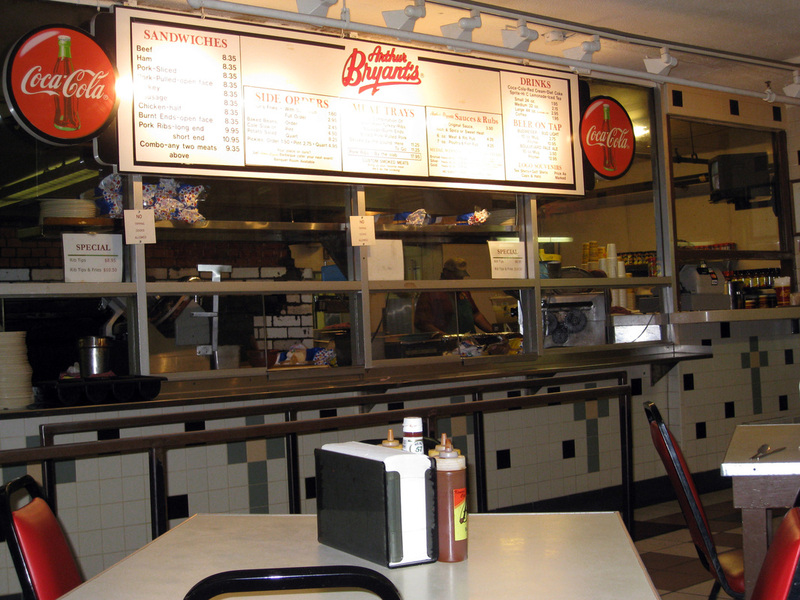 Too bad it seems that AB's is losing some of it's vintage charm. Although I have been here many times, and always loved it, my last 3 visits have not been all that great. For starters, the counter service was not friendly at all. No, wait, I change that, the guy was downright gruff. I almost felt as if I should apologize for being there. Our order was wrong and then I felt bad again for asking him to correct it, and he didn't seem to thrilled to change it. When my boyfriend ordered the guy seemed so irritated he could hardly stand still. What happened to the very friendly, jolly, flirtatious, and fun men that used to be back there? To me, they always made the experience of AB's charming and adventurous. I liked them a whole lot better. When we got to the cash register, the girl there was busy chatting with her coworkers and it took her a good few minutes before she even acknowledged our presence. This was also not the norm. At least, while we were eating, the one girl working the floor was very nice and friendly, asking if we were OK, clearing our plates. She was new, she said, and yet she seemed more authentic to the place than the others. The first time I ate at AB's, about 5 years ago, I was blown away by what I remember being sweet, tender, delicious burnt ends that I simply could not get enough of. The portion was huge and I remember having a difficult time leaving any to be wrapped up, and feeling like a beached whale ( in the best way!) as I rolled out the front door in a dreamy BBQ bliss. I even took pictures that I gazed at later, adoringly, vowing to return soon whenever my diet allowed. So, what happened? 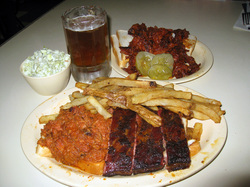 The last few times, including this particular evening, the burnt ends ($8.35) were dry, chewy, tough, and cold. Yes, COLD! OK, the bread was still that yummy, oh-so-bad-for-you, gushy white bread that I like only in this particular context, and the sauce was still tasty, tangy, sweet and spicy, but the actual meat was horrible. And, not just my food, but my boyfriend's ribs (combo with fries $10.95) were bad too, also cold, dry, meatless, and unmemorable. The one good thing on either of our plates was the pulled pork, which was at least warm, fresh, and had the perfect amount of tangy sauce. But, the rest, seriously, even the fries were greasy, limp, and lifeless. It was as if our whole meal were sitting around all weekend waiting to be reheated which, by the way, it wasn't- heated, that is. And, the portions seemed much smaller. Not only did I finish my meal this time, but I wasn't even full. No groaning, sighing, stuffing, or wrapping, simply a quickly-finished plate and not much enjoyment to show for it. So disappointing! AB's also serves cold beer on tap. I had a frosty mug of Boulevard pale ale ($3.50) and it was fantastic, cold, and delicious. Perfect for washing down spicy sauce. At least Boulevard is keeping it's reputation alive and well. Maybe we should've gone there for dinner. AB's is a dive, really, so it is not the cleanest place in the world. Things are a little shabby, the bathrooms a little worn but, still, it is perfectly clean for the kind of place it is. I wouldn't change it. The pulled pork was good, and the white bread and cold beer are always guilty favorites. The atmosphere hasn't changed in years, and I like it that way. The last few times I've been the food has just not been good, and the service was not as friendly as it usually is. The big TVs distract from the authentic experience.